The day is oppressively hot, as many are in summer in Zululand. The thermometer is pushing 40 degrees Celcius but the discomfort index reads “feels like 53”. It would be almost comical, a number that high, if it didn’t actually feel like 53 degrees. Guests find respite in air-conditioned rooms before climbing into game drive vehicles with beads of sweat rolling down their foreheads. Impalas stand in small groups, huddled in the shade of acacia trees, moving as little as possible to preserve the small amount of energy the sun has not already stolen from them. Lions lie deep in shaded thickets, belly to the sky, exposing as much skin as possible to the air, desperate for a breeze. Then Africa does the only the only thing she can in response to a heat like this. 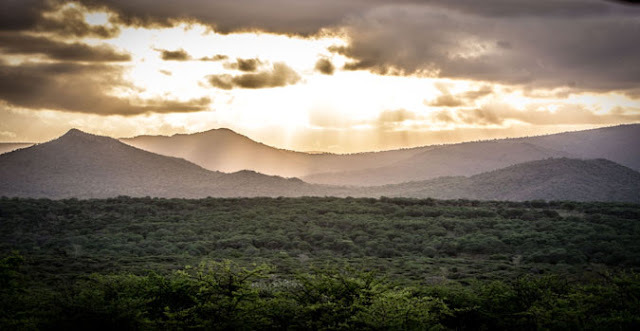 As the sun begins to wane she gathers the clouds and hangs them heavy in the sky above the bushveld. The air becomes still and stifling and the heat continues unrelentingly. Flashes of lightening dance in the distance and the deep vibrations of thunder roll through the land as we climb into bed, grateful for the air-conditioning. At eleven pm a deafening crack awakens us. The electricity dies. We rush to open windows around the house, as the world is lit again and again and plunged back into darkness each time. The thunder cracks loud and sure, sometimes settling into a tremendous rumbling. The open windows do nothing to ease the heat and the air is thick as molasses. Settled back in bed, lightening strobes my closed eyes and thunder continues its metallic roar. Slowly drops begin to fall. Larger drops splash on the increasingly water-soaked ground. The drops build until there is an army of them in full assault. Then the water pours down in sheets, as if suddenly Africa can no longer bear the heaviness of the drops gathered in her clouds. The electrical storm continues unabated, moving off into the distance as I drift precipitously close to sleep only to be awakened by a crash that is too close for the subconscious to tolerate. A slight breeze finally pushes through our window, providing sweet relief from the heat. The storm’s pattern of retreat and approach feels interminable but at some stage the rumbling makes its final departure. As dawn arises the groggy feeling of interrupted sleep begins to clear, much like the clouds which dissipate on the horizon. Our house has flooded in the night. The air is even thicker than the day before, and I begin to feel I am wading through it. In total 80 mls has fallen. Not the biggest storm this area has seen by any stretch, but big enough. Zululand has been suffering from the worst drought in living memory over the last few years. There was a point the past winter where we questioned whether or not we would have any grass to recover once the rains arrived. To escape the humidity, I take a drive with the windows open, beckoning in any wind that is willing. I expect stillness in the bush in deference to the heat but instead the bush is full of life. Impalas drink from puddles in the road. Warthogs roll gleefully in muddy wallows. Giraffes use their dexterous charcoal tongues to nibble at the green leaves on the tops of acacias. Frogs croak in chorus from newly filled pans. Glossy-coloured starlings splash their ruffled feathers in puddles that function as makeshift birdbaths. Crickets sing their high-pitched calls. Waterbuck duck their furry heads as they stand under acacias chasing the shade. The bushveld is an impossible shade of green. In winter, the reality of the sepia-toned landscape pushes this colour of green into a black and white memory. It is only after rain, that this deep emerald green emerges and one remembers. This colour green is the visual representation of the nutrients that sustain the circle of life. In Zululand, the summer can be harsh, hot and unrelenting. The heat summons the storms, which fill the dams and the rivers and allow the grass, bushes and trees to grow. The storms themselves can be inconvenient and sometimes terrifying. A Zululand safari in summer can be an intimidating prospect, but I promise that every second of discomfort is infinitely rewarded when one sees the bushveld in all its glory, teeming with life. Written by Shannon Airton. Originally published on Africa Geographic online. This post is very meaningful and magnificent for us. I couldn't find any knowledge on this matter prior to. After reading your article I got very much information about the African Safari Tour and it resolved many of my doubts.